AN incredible $18,000 was raised during the Coo-Wee Ride, an annual charity bike ride which raises much-needed funds and awareness for farmers and veterans doing it tough. Matthew Aldridge, a farmer from Northwood just outside of Seymour, travelled over a thousand kilometres from Adelaide to Wodonga in just 7 days. The ride tracked along the Murray River and went through Murray Bridge, Pinnaroo, Ouyen, Echuca, Yarrawonga and finished in Wodonga. The father-of-three said he had to endure some arduous conditions along the Murray River, including a fly plague, and over 30 kilometres of corrugated dirt road. “I wasn’t expecting the roads to be so scary. There were some very tough roads. On a few days we did well-over 200 kilometres and by the end of it you’re just absolutely spent. “However, the ride was nothing compared to what our farmers and veterans are currently going through,” he said. “I rode past some farms along the Mallee and it’s very dry. I got to meet some incredibly resilient dairy farmers who have been doing it very tough. The reality for them is not very nice at the moment. “All the incredible stories I heard along the way were definitely very inspiring and will fuel me to do more Coo-Wee Rides in the future,” Matt said. Mr Aldridge said up to $8,000 was raised for the Sisters of the North, a not-for-profit group assisting farmers in northwest Queensland who were hit hard by drought and floods in January. “The money that we raised was way more than what I thought we’d achieve. “We raised $10,000 for veterans at a function night at the Wodonga RSL,” he added. “We also have a couple of donations still to come through so we could be looking at $20,000 by the end of the week!” Matt said. Since its first year in 2016, the ride has raised well-over $50,000 for farmers and veterans suffering from mental health issues such as Post-Traumatic Stress Disorder (PTSD). 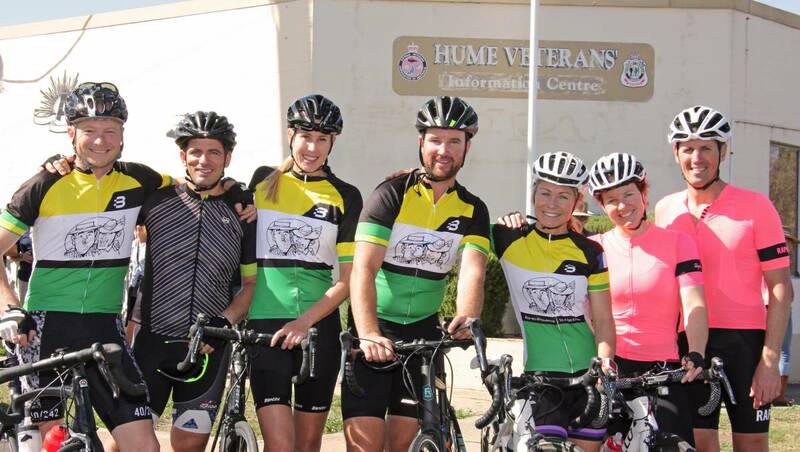 “I got to ride with some amazing veterans in the last leg heading into Wodonga. Sarah Watson, also organised a Coo-Wee Ride in France last year, and it was great to ride with her and a few friends from Wodonga,” Matt added. Matt also organised a function night on Saturday at the Wodonga RSL where country rock singer Brad Cox played his latest hits and Zoe Hayes helped organise a Dust Off Depression auction where even more money was raised. “It was great to get together with our amazing veterans and learn more about their inspiring experiences,” Matt added. Matt will also help facilitate the 2019 Euroa 6 Hour, which will involve primary and secondary school students riding a human powered vehicle around a street circuit in the centre of Euroa, in an effort to raise awareness and funds for farmers and veterans.